The Gefen EXT-COMP-141N Component Extender allows users to extend Component video signals beyond the A/V rack. The Component Extender Series can be used to extend a Component signal to cover the distances up to 330 feet. Industry standard Category 5e (CAT-5e) cable is used for the extension. The Component Extender sender resides next to the TV source. 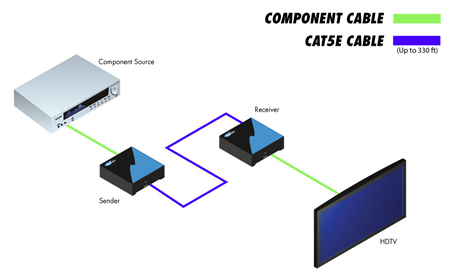 With the supplied Component cable, the Component Extender sender is connected to the source. The Component Extender receiver is then placed next to the monitor or projector. Industry standard Category 5e (CAT-5e) cable is used to link the Component Extender sender and Component Extender receiver together. Power only required only on transmitter. One CAT5 Cable for extension.